1 of 3 Heat a large pot of lightly salted water to boiling. Add shells; cook 10 minutes, or as per package directions. Drain and return to pot. 2 of 3 Meanwhile, combine bacon and ground beef in a medium saucepan over medium heat. Cook 5 minutes, stirring occasionally. Stir in pepperoni; cook another 5 minutes. Stir in 2/3 of the chopped scallions. Remove to a paper towellined plate with a slotted spoon. Discard drippings from pot. 3 of 3 In same saucepan, melt butter over medium heat. Sprinkle with flour and cook, whisking, 1 minute. Whisk in milk and bring to a simmer, whisking frequently. Simmer 3 minutes, whisking until thickened. Remove from heat and add cheeses. Whisk until smooth. 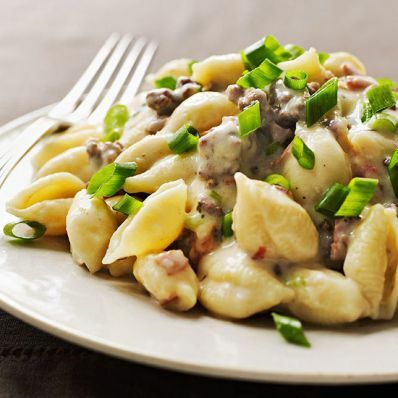 Stir in meat mixture and fold into pasta. Top with remaining scallions and serve. Per Serving: 47 g carb., 28 g pro., 82 mg chol., 25 g Fat, total, 13 g sat. fat, 2 g fiber, 469 mg sodium, 525 kcal cal.